When the Pleistocene Ice Age reached its peak around 22,000 years ago, continent-spanning glaciers covered large sections of North America and Eurasia like a sheet. As the Ice Age waned, the glaciers retreated. Occasionally large chunks of ice broke off from the glacier and became surrounded or even buried by soil and rock debris deposited by the melting ice sheet. Eventually, the blocks of ice also melted, leaving behind a depression in the ground. 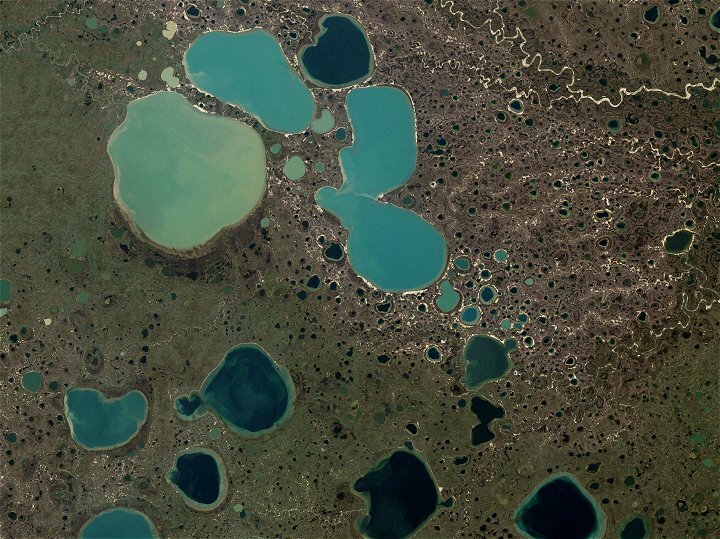 These depressions are called kettles; when they are filled with water, they are called kettle lakes, or pothole lakes. This natural-color Landsat 7 image shows blue and green pothole lakes in northern Siberia (Russia), adjacent to the Ob Gulf. The different colors of the lakes reflect different amounts of sediment or depth; the deeper or clearer the water, the bluer the lake. The arctic tundra in this area is permafrost: the top levels of the soil melt and warm in the summer, but the ground below is frozen solid year round. Rivers cut only shallowly into the hard, frozen ground, and they meander across the image like golden threads (upper right and lower left). The landscape is dominated by spongy peat bog, covered in shallow-growing vegetation such as moss that can survive the harsh winters. Pothole lakes dot the landscape of the Northern Hemisphere in the American and Canadian prairies, the Russian steppes, and throughout northern Siberia. Scientists use satellite images of these glacial kettle lakes to measure water clarity and to make environmental assessments. These lakes are far from agricultural land and settled areas, so they have fairly clear and unpolluted waters. Scientists also monitor these lakes to study climate change. 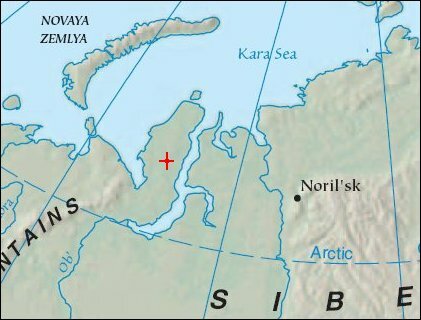 Researchers reported in Science that some glacial kettle lakes in northern Siberia have drained over the past 30 years as the region has warmed and the permafrost beneath the lakes has "cracked", allowing lake water to drain out.